Oooooh, you really got him good with that, B-dog! Wow. The egos on Big Brother never cease to amaze. Despite Matt's honest, even complimentary remark that he nominated Brenchel because they're a dominant force, and because, you know, this is a show based on evicting people competing for half a million dollars, they act as if he ran over their dog. On purpose. Rachel cries and says her nomination doesn't "make sense." Really? To us, it makes the most sense of anything this season. Then again, we are not certifiably insane. 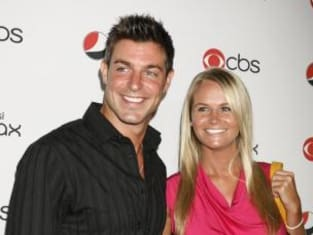 There was still a chance for either Brendon or Rachel to reverse Matt's nominations, of course, by winning the Power of Veto (hosted by Jeff and Jordan from BB11). Hilariously, Brendon and Rachel stay up all night long practicing bowling, only to be the first two eliminated. With the rest of the gang united against Brenchel, and the results more or less moot, they start playing for fun and having a grand ol' time. Kathy and Ragan both stuck it to Rachel last night. Britney ends up taking it for her third POV in five weeks. Woo Pig Sooie! The Arkansan is not only a real character, but emerging as a dangerous force in the game. Rachel, of course, becomes even more bitter, whining and confronting Kathy for cheering when she knocked her out of the PoV. Kathy refuses to apologize. Awesome. As for The Saboteur, Ragan, he was a little bit of a letdown. Reading suggestions from America, he refuses to hide Rachel's extensions or put cheese under her bed, though he does get in some good digs about having to actually touch said extensions, then musing about whether anyone would notice a change in smell. He accepts a challenge of attempting to come between them. In the end, it was a good choice, as the Saboteur's claim that Brendon is tanking competitions subtly, unintentionally implied that the Saboteur is Rachel herself, trying to throw her man under the bus. Brenchel is clearly rattled, as evidenced by Brendon’s strategy at the PoV ceremony, if you can even call it that. He basically berates Britney in hopes that he will be eliminated instead of his girlfriend. Because that is what a knight does. Barf. Astonishingly, Britney keeps the nominations as is. The question becomes which of these morons the six vote-casters boot from the Big Brother house? We'd oust Rachel, on the simple premise that she's painful. She makes our lives entertaining, sure, but imagine living with her. Besides, is Brendon really that threatening, or that much of an a$$ when you take Rachel out of the equation? It's unclear. Conversely, Rachel will clearly be a menace. Make it so, houseguests. Make. It. So.